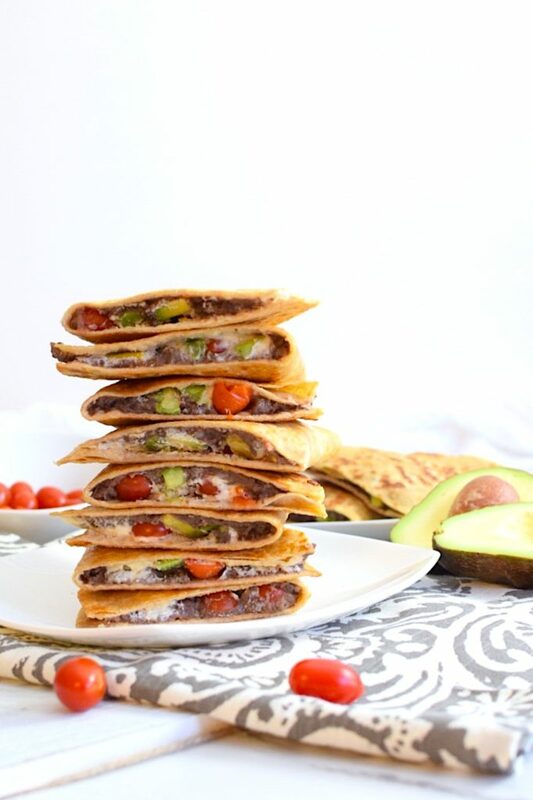 These Vegan Black Bean Quesadillas are a healthier spin on Mexican food that’s Vegan, quick and easy to make, kid friendly and muy delicioso. Ok, living in southern California has spoiled me. If I try Mexican food pretty much anywhere else in the country, I’m like ew! (Sorry TexMex lovers.) Real Mexican food is soooo good! The problem is that most Mexican Restaurants cook their food with poor quality fats, oils and fatty meats. There’s also no shortage of cheese melted onto most everything. 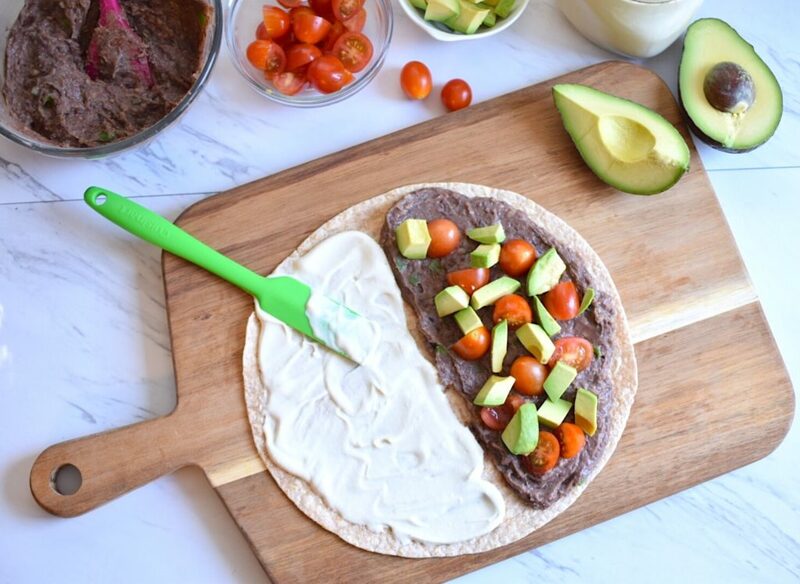 My Black Bean Quesadillas keep the authentic Mexican flavors without all the other stuff. In fact, they’re even vegan with a gluten-free option. Using black beans, spinach, red onion, avocados, tomatoes, and my Cashew Sour Cream, these gems are protein packed, plant-based and so delicious!! Good When You’re on the GO! 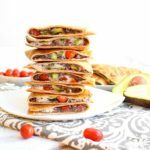 I love making a large batch of these quesadillas at one time (meal prepping) and keeping them in the fridge to nibble on throughout the week. Also, since there are no animal products involved, they’re great to pack for a picnic lunch, as they’ll be totally fine to leave unrefrigerated for several hours. I had a client tell me that it’s so hard for her to get her kids to eat healthy, plant-based food on the regular. 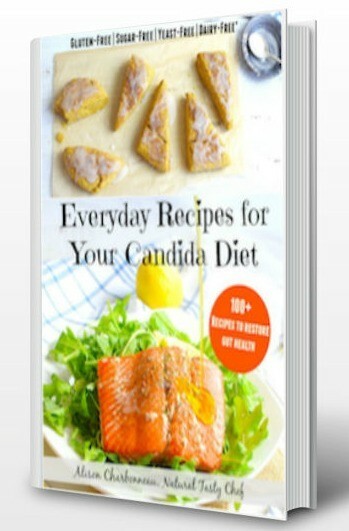 Personally, if I know little ones might be snacking on my food, I always throw my Black Bean Quesadillas on the menu. They’re a great finger food, they taste delicious, and we can always sneak some more veggies in. Shh! Don’t tell them! One of the stars of this recipe is, of course, black beans! And I can’t talk about beans without mentioning my hometown of Boston! Hundreds of years ago the city called itself “Beantown” as a publicity stunt and the name stuck. And it suits them, as Boston chefs were famous for baking their beans in salt pork and molasses. Looks like Bostonians were onto something, because as it turns out, beans are one of the healthiest foods on the planet. According to the Blue Zones guidelines (which reveal what the longest-living humans in the world eat and don’t eat) beans make a big impression. All of these super healthy, Blue Zone societies around the world consume some form of legumes daily, usually about 1 full cup! Beans are low in fat, but high in fiber and protein. They’re also pretty affordable, at about 99 cents for one can! That’s much cheaper than buying animal protein. Black beans in particular boast the highest amount of antioxidants, due to the dark color of the bean. This adds to the findings that darker colored foods (like blackberries, red wine, and purple cabbage) have a higher antioxidant profile than many lighter colored fruits, vegetables, and legumes. So we’ve learned that beans are good for us and are a staple food in the diet of the longest living societies in the world. We learned that the darker they are (like black beans) the more antioxidants they have. And we’ve learned that black beans go really well with Mexican food, which doesn’t have to be unhealthy. 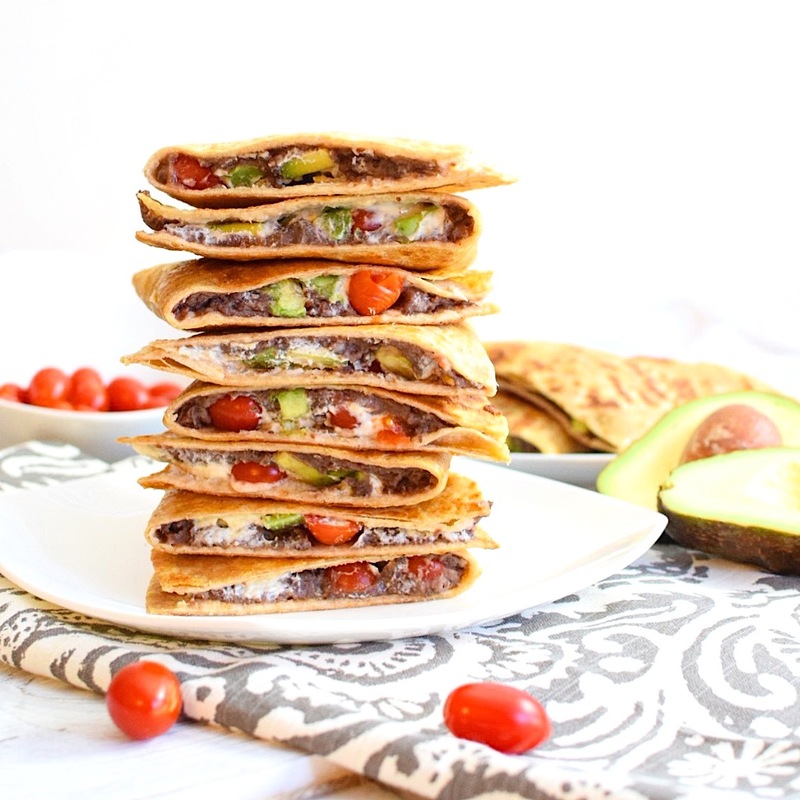 Next time you host a little fiesta, give my Black Bean Quesadillas a try. And don’t skimp on the guacamole! 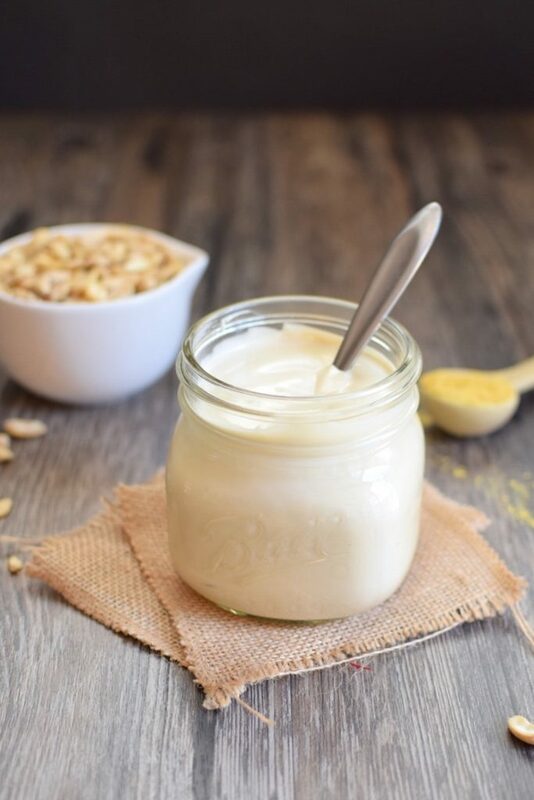 This recipe calls for our Easy Vegan Cashew Sour Cream Recipe, but you can also sub your favorite vegan shredded cheese, or use both! If using Cashew Sour Cream, make that first and set aside. Prep the avocado and cherry tomatoes but chunking and dicing and placing them in small bowls. In a separate bowl add the organic refried black beans. Set aside. Have the avocado, tomatoes, vegan cheese or Cashew Sour Cream and refried black beans all lined up in bowls by your burner. Have a cooling rack nearby as well. 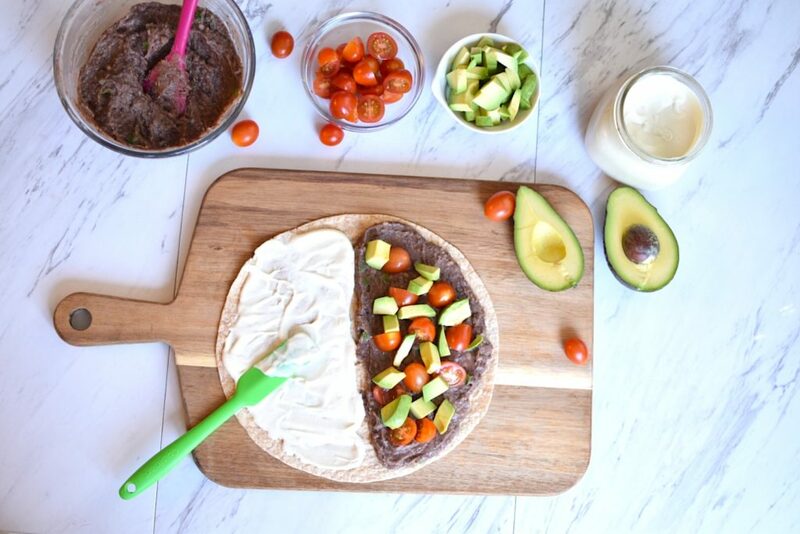 Start by spreading a thin layer of the black beans on half of one tortilla; top it with a sprinkle of avocado, tomato and vegan cheese. If using Cashew Sour Cream, spread a thin layer of that on the opposite side of the tortilla. Be careful not to add too much filling as this will make the quesadilla very big and difficult to flip. Now, flip the quesadilla by taking your free hand (the one not holding the spatula) and gently place it on top of the quesadilla (careful as this will be warm). Place the spatula under the bottom of the quesadilla, close to the open end. Gently flip the quesadilla over and let sit for another minute or so. These are best when they brown a little. Finally, remove from the pan and place on a cooling rack before you cut it in half using a serrated knife. *While you are waiting for this quesadilla to brown, you can start prepping the second quesadilla.